We at Handy Flowers understand that when it comes to weddings, every detail matters. That is why we strive to provide beautiful floral arrangements and create a spectacular and stylish set-up for your special day. 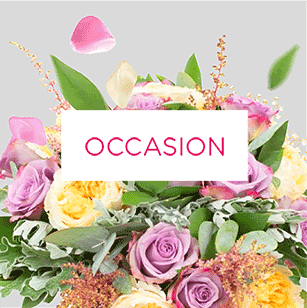 • Accredited services – we are a well-established flower delivery service with a vast knowledge of the florist industry. • A team of professional wedding florists – our skilled and dedicated experts have years of experience in crafting the best wedding arrangements. • Leading growers – we work with both big and small local growers that supply us with a variety of top quality and fresh flowers. • Fresh buds and blooms – it’s your wedding day and we know only the best flowers will do for you. • Quick and reliable flower delivery – we will deliver your wedding flower arrangements on the day of choice without any delays. From choosing the wedding bouquet to selecting the flower arrangements, our professionals can offer expert guidance. We can assist you with choosing the ideal flower types and colours to create harmonious and breath-taking flower arrangements that will be the talk of every table. Our consultants are passionate about all things flowers and will come up with remarkable ideas for your special day. From casual or formal to rustic or glamorous, we can find the perfect flowers to fit your wedding theme. Our experts will be delighted to assist you in planning your wedding day. 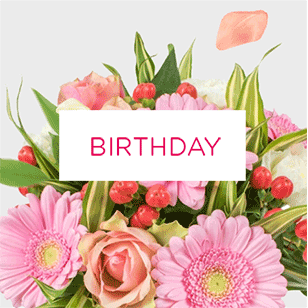 The key to the success of our business is our imaginative and dedicated florists. Whether it is a small outdoor wedding or a big event, we can create stunning floral designs that will impress your guests. 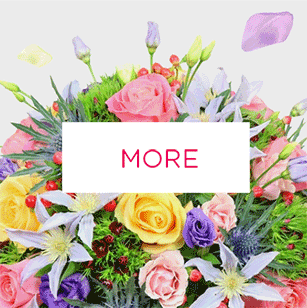 Our London florists don’t simply specialise in arranging flowers; they specialise in weddings. You can fully rely on them to help you make the right choice when selecting your flower arrangements. At Handy Flowers we deliver fresh flowers anywhere in London seven days a week. All of our wedding flowers, centrepieces, arrangements, and bridal bouquets are transported to the location on the morning of the event or the night before. We believe that each wedding is unique and deserves an original approach and a personal touch. That is why our professionals will work closely with you to ensure that your requirements are fulfilled and to make your vision of the perfect wedding become reality. Learn what we can do for you on 020 3409 3030. Handy Flowers is a London based company that specialises in arranging wedding flowers and provides a wide selection of flowers, centrepieces and more. We offer flexible and cost-effective packages to match your individual wedding style and your budget. We have been the go-to bridal flower delivery service for many couples in London. We have helped thousands of couples experience the wedding of their dreams. We have a highly-talented team of creative wedding florists and artists who will work tirelessly to ensure that your flowers are perfectly styled. Our company has established good relationships with some of the top growers in London. In this way, we have greater variability of beautiful bridal flowers. Contact us today on 020 3409 3030 for a free consultation. Organising a wedding can be quite a stressful experience. Even simple tasks like choosing the wedding flowers can cause a lot of headaches. Not sure where to start? 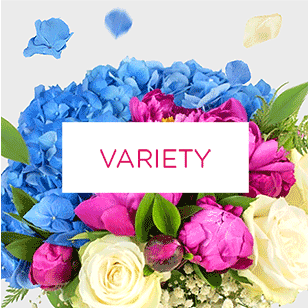 Check out our flower shop where you can choose from a variety of options. Then, simply tell us what you would like us to craft and we’ll do it for you. Our wonderful flowers are brimming with bloom and fragrance and will make the perfect addition to your special day. 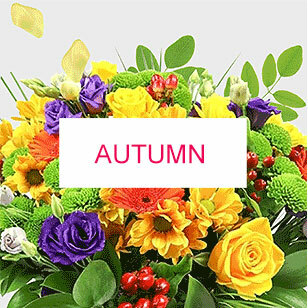 Unlike other flower shops in London, we offer free flower delivery to any address. 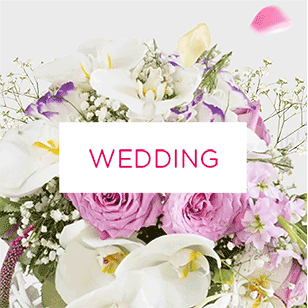 We guarantee that you will get your wedding flowers delivered in top condition. 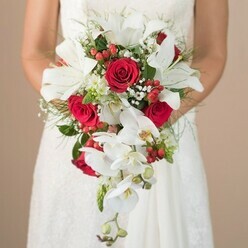 We will craft a bridal bouquet you will be happy to walk to the aisle with. Whether it is a tangle of tiny buds, a mix of lush violet, lavender and white blooms or an elegant bundle of roses and lilies, you can find the perfect option with us. Picking the bridesmaids floral arrangements is an art and science itself. 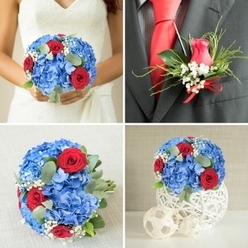 The flower accessories usually complement the bridal bouquet and the main colour palette. The floral arrangements vary from pomanders, hand-tied posies, hair flowers, and baskets. 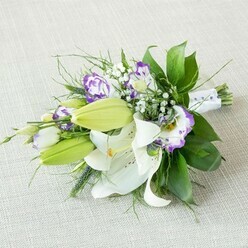 For pageboys, you can consider smaller flower arrangements or buttonholes. Almost any bloom will work for the groom’s boutonniere, but its best to pick the same flowers used in the bridal bouquet as a symbol of the connection. The floral accessory can be either a buttonhole or a corsage pinned on the left side of the jacket. The flowers should not be brown around the edges and should be able to endure hours of hugs. That is why we get your wedding flowers delivered fresh and in excellent condition. 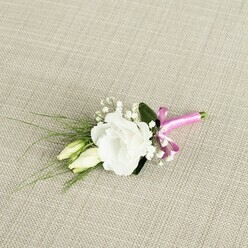 Give your wedding guests the chance to neaten their outfit with a lovely floral accessory. 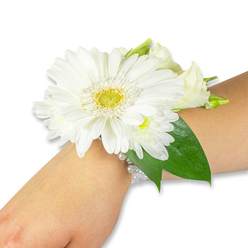 Corsages are particularly suitable for the important female guests like the mothers, while the buttonhole is reserved for the male guests like fathers and grandfathers. The single stems are great for the rest of the wedding guests. Wedding ceremony flowers can give your wedding venue a personal touch and intimate feel. Whether it is a simple and sweet pew end or rich and versatile flower displays, we can make the place you’ll say “I do” truly special and unforgettable. Our splendid floral arrangements will fit equally well both a small parish and a more contemporary venue. If you are planning a civil ceremony, you may need to check if you can bring your own flowers. Wedding flowers can set up the right atmosphere and bring a pop of colour and personality to the place. Often these floral set-ups reflect a certain theme or season. Looking for wedding reception flowers inspiration? Check our gorgeous selection of wedding flowers, floral displays, and stunning centrepieces. We will work around your ideas and will provide you with valuable advice and the most beautiful wedding floral arrangements. 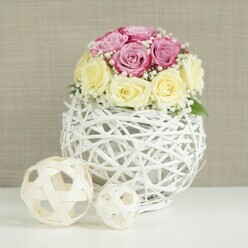 In addition to wedding flowers, we can also help you with table arrangements. No job is too big or too small for us. Contact us now and you will be amazed at what we can do for you!